You can either choose from our custom designs or send us your custom web site design. It takes 10 minutes to setup and start using your customer web portal. "Live Courier Software" comes with an advanced web portal for your clients. It's not just another template with simple tracking function. You will have all the functionality as a major courier web site in the industry. Web portal is fully manageable within "Live Courier Software" control panel. You can update all images and web page contents with a simple click. Your clients can create shipments with or without logging into the portal. Save shipper and/or receiver information. Restrict services your customers can select. Print self or third party labels through the web portal. Automatic tracking system will be activated for third party labels. Web portal comes with tracking module installed. "Live Courier" software automatically tracks Fedex, TNT, UPS, DHL and USPS shipments; updates web portal and control panel. Other couriers can also be integrated to our system FREE of COST. No need to worry for shipments you forward to third party couriers. For self pickup and delivery shipments, you can simply scan labels for each step and update the system in real time. Your clients can access to live tracking data. You can choose from our template library, change and/or update designs. We can also provide a custom web site design for your web portal or even integrate your current design into powerful "Live Courier Software" backend. 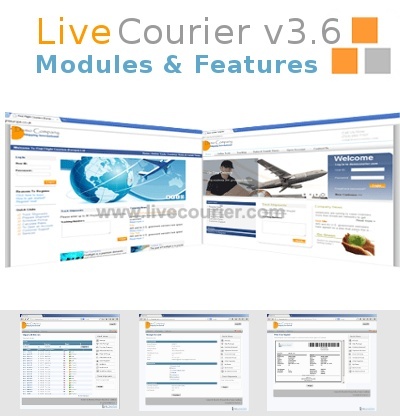 Full control for your web page is provided by "Live Courier Software" control panel. Your clients can view your rates and estimated transit times from the web portal simply by selecting their pickup location and destination. These rates are calculated based on your zones and price tables. Live Courier is ready to use with credit card payment gateways. You can easily integrate your credit card payment gateway and start getting payments for your invoices.